Bottle: Beautiful package overall, Wooden Box with slide up cover/door some straw-like material which opens to reveal a bottle of somewhat unusual design. Bottle is clear glass at top with gold foot (square with a heavy base and slightly pinched in foot which then gently bows out to a squarish shape which goes up to an inward sloping apex to a medium-long neck topped with a synthetic black cork and a plastic ( but looks like glass) stopper top with a clear plastic neck wrap. 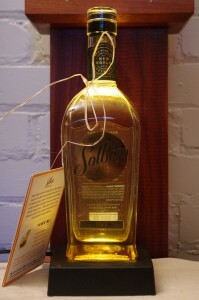 Labels are clear Plastic with a metallic ink and black lettering for the Solbeso graphic with a bronze on black neck label. Altogether an attractive and distinctive package. Other: A very interesting product but probably doomed by lack of market . Not all good ideas win without a lot of money behind them. Also it seems like even if it did take off the question of scaling up production could be a major hurdle. Placeholder website at the moment. They really need to get some cocktail recipes and green stories going or this spirit is doomed.